Only child of Inez and Edo Hilding Anderson, Zanna Anderson, whose formal name was Lovisanna, had artistic talents remarkable enough that by age 21, she had graduated from the National Academy of Design in New York City. She was especially skilled in portraiture. It seems likely that if she had lived into middle or older age, she would be known today as one of Nebraska’s most accomplished and famous artists. However, complications from spinal meningitis confined her to a wheelchair from childhood. Known as beautiful in manner and appearance as well as loving and thoughtful, she had the good fortune of devoted parents who lived with her, nurtured her special talents, and made wise decisions that kept her in a secure environment so she could have a very expansive and rewarding career. When Zanna was three, she and her parents moved from her birthplace of Holdrege, Nebraska to Yankee Hill, near Lincoln, Nebraska. During her grade school years, she was tutored at home. Her father Edo, a graduate of the University of Nebraska, held a job as a pharmacist. Indicative that talent for art was in the family, Edo had used his drawing skills at the University as illustrator for the Cornhusker yearbooks of 1911 and 1912. However, his work, primarily editorial cartoons, was controversial and stirred accusations of being too raucous and offensive. In 1935, the Andersons moved to New York City where Zanna attended Barnard School for Girls and then the National Academy of Design, graduating in three years. Among her teachers were Karl Anderson and Charles Curran. To support the family, Edo took a job as a jewelry store sales clerk, but it was not long before Zanna began making money through portrait painting. Requests, often the result of people seeing Zanna’s work in exhibitions, came from both New York and Nebraska. Commissions from prominent and wealthy people included artist George Harold Mitchell for a painting of his wife; playwright Robert Sherwood of his daughter; and violinist Frances Cotti of his children. One of Zanna’s portraits, Day’s End on the Farm, was of Ernie Payne, a Nebraska pioneer, and was used for a 1936 cover of The Etude, a national music magazine. An unusual and prestigious commission was a portrait of King Adolf of Sweden for display in New York, which Zanna painted from a photograph she received from the King. In New York her portraits were exhibited with the National Association of Women Artists, Society of Independent Artists, Allied Artists of America, National Academy of Design, Grand Central Art Galleries, and Columbia University. 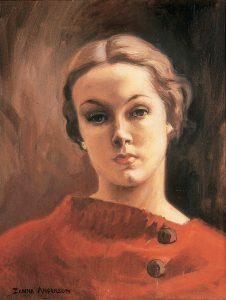 When visiting Nebraska at age 19, it was written: “Miss Anderson remains unswervingly loyal to her home city of Lincoln and the Midwest.” (Museum of Nebraska Art) She exhibited in Omaha with the Five States Exhibition at Joslyn Art Museum 1936 and 1937; and in Lincoln with the Nebraska Art Association at Morrill Hall in 1937 and 1938. In 2003, Zanna’s artwork was included in the Museum of Nebraska Art’s exhibition titled Women Artists from the MONA Collection. Held at the Museum in Kearney, Nebraska, it was organized by Josephine Martins, curator of the exhibition. Her work is in the collection of the Museum of Nebraska Art and in Lincoln at the Sheldon Museum of Art, Federal Court House, and Lincoln General Hospital which has her portrait of John L. Teeters, Lincoln jeweler, hospital philanthropist, and president of the hospital board. Affiliated with that hospital was another of Zanna’s portrait subjects, Dr. Hiram Winnett Orr. A pioneer of plaster casts to set broken bones, he was an orthopedic surgeon for whom she had much admiration. Reversing the usual procedure of Zanna being commissioned to do a portrait, she persuaded him to sit for her. She wanted to convey his professionalism by posing him in his surgeon’s gown and holding rubber gloves in a way that drew attention to his hands. She said: “To me, the hands portray briefly the character of a very fine man devoted to and adapted to his life work. It is wonderful what they have done.” (Museum of Nebraska Art) Also in Lincoln, William Gold, founder of Gold & Company Department Store, commissioned Zanna to do his portrait which he displayed prominently in his downtown store. In 1955, when Zanna was 38 and at the height of what might have been one of the most distinguished art careers of any Nebraskan, she died in New York City. As a memorial to their daughter, Inez and Edo gave Zanna’s painting, The Return, to St. Paul Methodist Church in Lincoln. It was an image of Christ, which reflected their daughter’s commitment to Christianity and her childhood attendance at the Church Sunday School. The Museum of Nebraska Art has five works by Zanna Anderson.